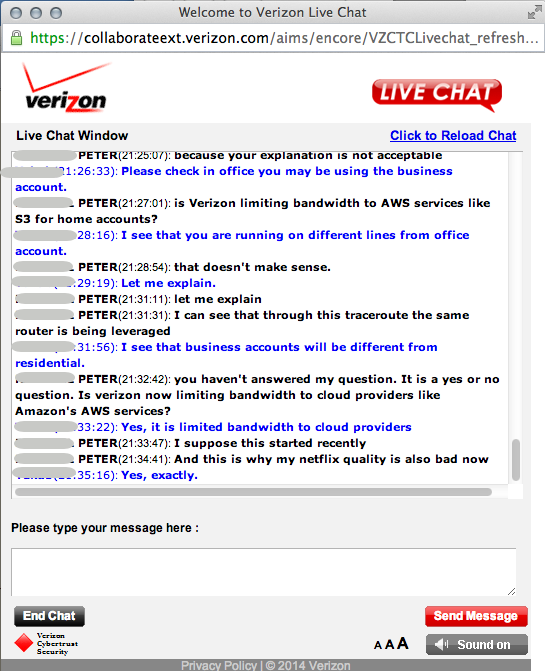 Is Verizon Warring on AWS, Netflix? A bunch of articles that were forwarded to me today -- Mashable, GigaOm, and a blog -- all about the consumer experience with FiOS, Verizon's fiber-to-the-home service, is throttled to certain destinations like AWS. In Miami Beach, at ITEXPO, Dr. Satwant Kaur's keynote this morning centered on how technology, especially nanotech, is transforming healthcare. Robotics, sperm and magnets combine to improve conception. I wonder what that procedure is like (and how much it costs). Nextiva hired Ira Feuerstein to run its channel. The big news is that AT&T is selling off its old SNET division to Frontier. I feel sorry for my friends and family in Connecticut as they went from a local RBOC (SNET) to an ambivalent giant to a stingy ILEC (Frontier). Frontier has more public utility commission complaints than either of the evil RBOC twins. This isn't the first acquisition for Frontier. Windstream CEO Jeff Gardner stated during the Bank of America Merrill Lynch 2013 Leveraged Finance conference, "We're really at a time where we can start looking out at acquisitions again to accelerate this transformation focused on the enterprise space obviously." Despite having work to do on the PAETEC integration still, Windstream will be looking for assets to add to its national enterprise system. Likely, this will be a data center on the West Coast. That could prove expensive for the following reasons: data centers are a hot commodity that a number of other CLECs are also looking at for purchase; Windstream's debt load is high and if it weren't for the stock dividend it pays out, the stock would reflect it; and their revenue profile. Let's look at WIND revenue: 72% comes from broadband. The FCC starting with Chairman Powell did everything it could to get to a Duopoly. There were some crumbs given to alternatives but mainly just crushing blows (Brand-X, DSL, etc.). Granted, WISPA won the 3650 MHz battle and many non-ILECs won BTOP and BIB money, but we are stuck with a Duopoly for most services. It is cable or ILEC. High speed broadband, DSL, cable modems, Gigabit, fiber to the home, metro Ethernet, DS3 and T1, even LTG and 4G are just network transport. Yet that is all the advertising is about, right? Why? Because the most important thing today is access to the network. Cisco did a survey of young execs. They predict video will be big. You'll see. "A global study announced today by Cisco revealed that the majority of these next-generation executives intend to depend heavily upon business-class video to connect with their teams, colleagues, suppliers, customers and prospects, as well as to help their businesses deliver new products and services." "The 2013 Cisco Global Young Executives' Video Attitudes Survey gives insight into what management-track leaders aged 34 and under think about business-class video": "Three out of five young executives say they will rely more heavily on business-class video during the next five to 10 years." <-- in the next 5 years! UNSI has been in the news lately. It was originally American Broadband, reselling DSL nationally. Then it changed its name to United Network Services, Inc. and became a facilities-based carrier, with 18 Points of Presence (PoPs) and interconnections (and NNIs) to over 150 carriers in the US (including cable, DSL, wireless, CLEC and ILEC). "UNSi's partners are able to leverage the relationships with these carriers, paired with the cost savings and convenience of working with a single partner, under one invoice." "Florida Rural Broadband Alliance, LLC (FRBA) is a regional collaboration of local governments, community activists and economic development agencies from rural and economically disadvantaged communities located throughout 15 counties within Florida's Northwest Rural Area of Critical Economic Concern (NWRACEC) and the South Central Rural Area of Critical Economic Concern (SCRACEC)," reads the website for FRBA. It continues, "The FRBA project will build a new Middle Mile broadband infrastructure, which will link together providers of vital public sector commercial services with private sector non-profit entities for the first time in these two struggling regions of Florida. At this time, only 39 percent of the FRBA region has broadband service. ...At the end of the 3-year build out period, FRBA's project will deliver up to 1,000 times the existing capacity within the coverage area.